Magicious Slot is a 10 paylines and 5 reels online video slot game powered by ThunderKick software platform. This beautiful slot can be played using coin sizes of 0.01 per spin to 100 per spin. This slot offers a jackpot of 4000 coins on your total bet and return of player percentage for the game is 97.6%, which is so very good. You can play Magicious Slot at any ThunderKick casino sites for fun or for real money. As the name suggest, Magicious slot features a magic show with lots of magic tricks going on always. They will form lots of winning combination for the players as well. 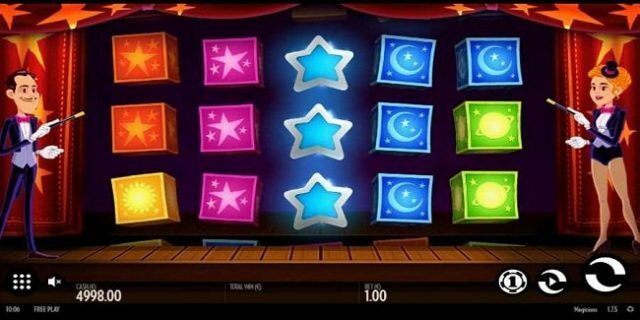 This magic slot includes symbols like levitating magic boxes, stars and magic balls. Before you start playing this slot, you should take a look at the available options of this game. The ‘bet” option is used to choose the bet you wish to make, the ‘spin” option is used to start the game and the ‘auto Play” option can be used to play the game for a chosen number of times without any interruption. There are two special features involved in this slot game like Win Two Ways and the expanding wilds. They form a greater value of winning combinations as well. The wild symbol in this game can substitute all other symbols appearing on reels 2,3 and 4. They will expand across all the three rows and hence known as expanding wilds. This feature also includes a re-spin as well.